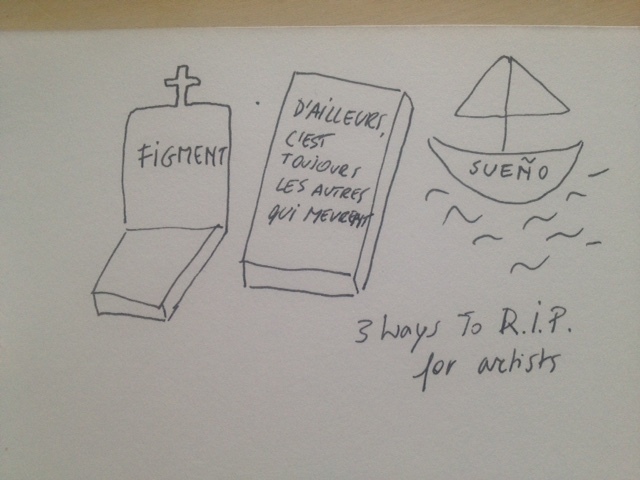 It didn't really work out that way, but Andy Warhol wanted "Figment" to be written on his grave tomb. A figment is "a thing that someone believes to be real but that exists only in their imagination." Being a figment is of course an excellent way to keep on living also after death. Marcel Duchamp was buried in 1968 at a cemetery in Rouen, France. He got his way and on his tomb he makes his last pun: "D'ailleurs, c'est toujours les autres qui meurent." ["Besides, it's always the others who die."] Mmm, you might wonder, who's the joke on? When Joseph Beuys died in 1986, his ashes were scattered at sea on a boat called Sueño. Captain Nagel wrote down the coordinations: “54° 07,5’N 08° 22,0’E”.